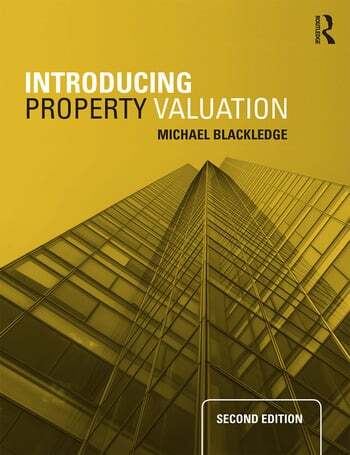 This new edition of bestselling textbook Introducing Property Valuation provides students with a comprehensive introduction to the concepts and methods of valuing real estate, helping them to progress successfully from basic principles to a more sophisticated understanding. Taking a practically oriented rather than purely theoretical approach, the textbook equips readers with the skills to undertake their own valuation calculations. Fully updated to reflect recent developments in regulation and practice, experienced tutor and valuer Michael Blackledge demonstrates how the principles can be applied in professional practice in line with the requirements and guidance provided by the International Valuation Standards Council and the Royal Institution of Chartered Surveyors. Online material accompanies the new edition with Q&As and pre-programmed excel spreadsheets enabling students to prepare their own calculations. The five traditional methods of valuation are outlined and the practical applications of the two main approaches, the comparison and investment methods, are fully explored. The use of discounted cash flow and quarterly in advance calculations, topics which are not always adequately covered elsewhere, are also explained. Accessibly written with a full range of worked examples, case studies, clear chapter summaries and extensive further reading suggestions, this book is essential for any student of real estate and its valuation. Michael Blackledge has worked extensively in practice as a surveyor and valuer and in higher education and is currently a visiting Lecturer in the School of Civil Engineering and Surveying at the University of Portsmouth, UK.